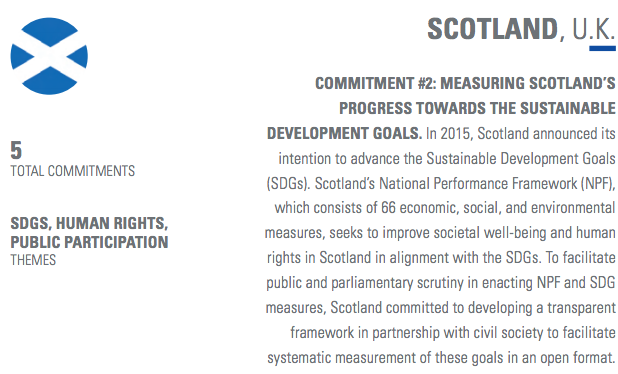 Scotland’s Sustainable Development Goals Network is a loose coalition of 200 partners committed to advancing the Goals in Scotland, both domestically and internationally. In July 2015 Scotland became one of the first countries in the world to adopt the Global Goals for Sustainable Development (SDGs). The SDGs are a set of 17 goals which all UN member states are using to mobilise efforts to end poverty, fight inequalities and tackle climate change. Scotland should be a place where people can satisfy their basic needs and enjoy a good quality of life. Unfortunately, this is simply not a reality across Scotland today. The SDGs give us the framework to achieve real change, from eradicating poverty to ensuring a good home for us all. The Network is open to all – if you would like to join please sign up to our forum on basecamp. The site globalgoals.scot has been developed to serve as the national platform for the Sustainable Development Goals (SDGs) in Scotland. It has been set up by the Big Lottery Funded Open Government Pioneers Project and is being developed in collaboration with Scotland’s SDG Network. Since 2007, Scotland has worked to an agreed-upon set of national outcomes (Scotland Performs). We also take a strong rights-based approach, as set out in Scotland’s human rights plan. As such, one of the commitments in our OGP action plan is to align both of these with the Sustainable Development Goals. Find out more about the commitment. By promoting the principles of accountability, participation and transparency, open government strategies and practices can inform the process by which countries pursue the SDGs throughout the policy cycle (namely, during their design, implementation, monitoring and evaluation). This webinar is the second in a series from the UK-wide Open Government Pioneers Project. Graham Long from Newcastle University discusses the UK implementation process for the UN Sustainable Development Goals and the role of citizen participation. See Graham’s co-authored report on the 2030 Agenda here.